With the low, of 1000 mb, currently over Orissa, good rainfall was recorded in Chattisgarh. 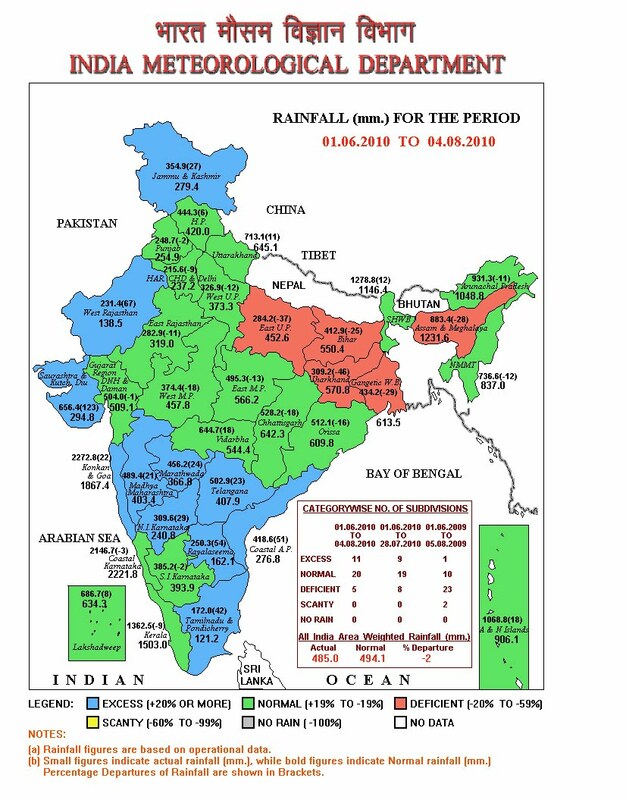 Rainfall ranging from 246 mms in Narayanpur, 201 mms in Kanker, 121 mms in Bijapur and 74 mms in Dhamtari were amonst the high rains in the state. Good distribution of rains ranging between 50-90 mms were recorded from adjoining Orissa and east M.P. That means, the rainfall radar is in the south-west quadrant of the low. Many a times, we have to see in which quadrant of the low the rain clouds are concentrated. Today, we see the satellite image showing good clouding over South Chattisgarh and adjoining Vidharbh. No inflow from the Arabian Sea has yet started towards the low.Maybe as it is not too deep and is at 1000 mb. As the low has crossed, should see a day of rains in Jharkhand and Bihar (deficit areas). But as the low moves west, this region will see a decrease in rains. But,we will see rains increasing in Vidharbh, North Maharashtra and Southern M.P. from Friday as the low zips westwards. Marathwada and Northern Maharashtra can expect cumulative rainfall of around 40-70 mms next 2 days. Rain in battered Gujarat will be less than their previous experiance. Southern peninsula ?? Status Quo ! We have discussed, not to expect too much from this low. Seems to be holding on to our presumptions. The system may not sustain, as it subsequently moves into Rajasthan region, and by Sunday should fizzle out. 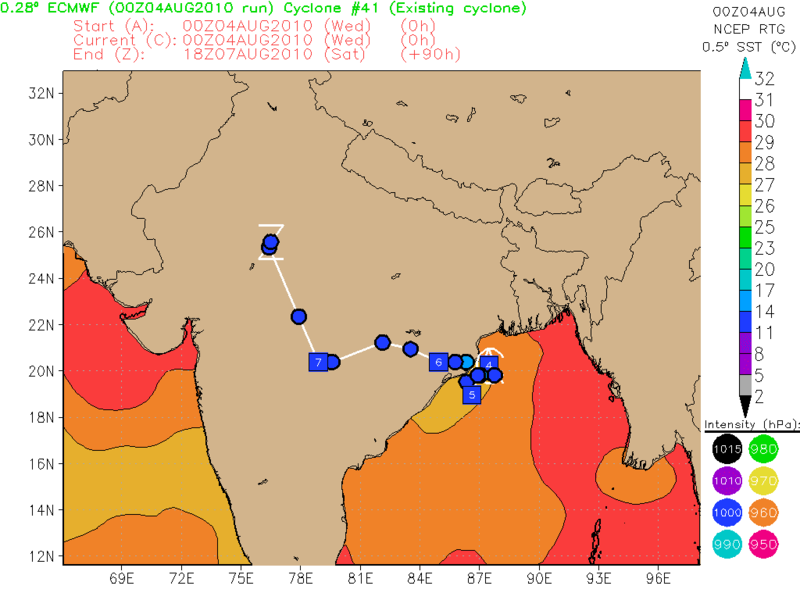 See estimated track forecast & SST by ECMWF. 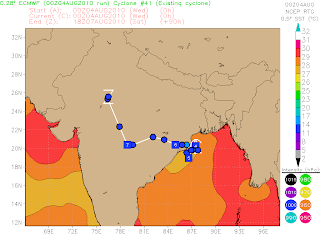 Gujarat, may see a commencement of rains from Saturday, along with konkan coast. Mumbai, had a respite from rains last few days. The day was warmish on Thursday, with the high at 31.5c in the city and 32c in the suburbs. I think its after nearly 50 days that Colaba had 0 mms of rain on Thursday, 5th. August :) "Vagaries" had forecast no hindrances with upto 10 mms of rain and day at 31c. As the winds from the west will start towards the low, I think Mumbai should get rains, heavy showers sparsed in between, from Saturday. Maybe upto 40 mms on that day, but intensity of rains surely decreasing from Sunday evening (25-30 mms on Sunday), as I do not see much in this current system. We hear of flooding and widespread rains in Leh district. Well, personally, I have really not followed this up, and an upper air W.D. which was anyway heading towards the Himalayas could have interacted with the local terrain. From IMD's bulletin yesterday - "The western disturbance as an upper air cyclonic circulation extending upto 5.8 kms a.s.l. over Jammu & Kashmir and neighbourhood persists. System is likely to move east-northeastwards". As we know, local conditions in Leh region are very unpredictable, and can be forecast only if one is present there to actually observe the rapid changes in weather there. The seasonal all India defcit has now reduced from -4% to -2%. 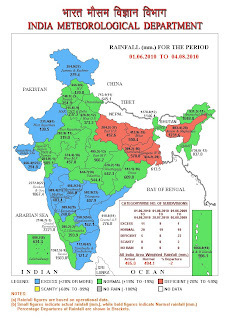 As we have discussed in previous write ups, the "red" region of central India is now "green". A "red" area now remains in the eastern U.P/Bihar/Jharkhand regions, which we expect to get rains today, but may not be enough. Read about the Leh incident, quite sad. I guess the ultimate frontier for any weather forecaster any where in the world would be to be able to predict about situations like this (similar to 26/7 in Mumbai). It's very tough today to predict the likelyhood of such random weather spikes with the technologies that we have. But I guess in future a more efficient early warning system may be available.